Ashe juniper, conservation, texas hill country, terrace, Oaxaca. All of us who live in the Texas hill country are well acquainted with the Ashe juniper and its challenges for land conservation. 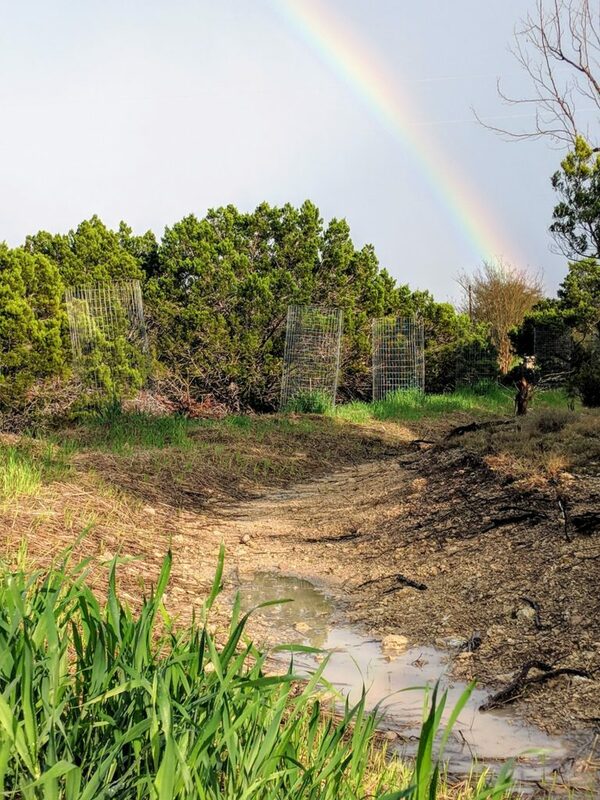 This blog post is about a land restoration project on a degraded caliche hillside. I’ll show all the steps of what we did to harvest water, control erosion, improve soil conditions and increase species diversity on the land. Soil conditions common to the site. Notice all the bare soil. The flags marked level lines that we cleared of Juniper. Ashe juniper is a native Texas tree is very well adapted to our climate and soil conditions. It is often seen as a menace, but I have grown to respect this tree for what it really is, a tough pioneer species. The cedar berries are also one of the most utilized sources of food for many species of wildlife. This is why it spreads so quickly as the seeds are being eaten and “planted” with manure by birds and small mammals. Often in very degraded areas of our caliche and limestone soil, the cedar trees are the only plant with any topsoil around them. This dark soil was created by the cedar trees! Cedar trees also have very thick evergreen foliage that intercept heavy raindrops before they hit the soil. This protects the bare soil from the initial impact of the raindrops and acts like a slow filter for the rainfall into the soil. This is very helpful during our common flash flood deluges when water is moving too quickly and causing damage. However, the cedar trees can begin to form a monoculture thicket which makes the land less valuable to wildlife, soil micro-organisms, and humans. The client wanted to clear cedar, harvest water, plant natives and also some fruit trees. They wanted to do the right thing for the land. 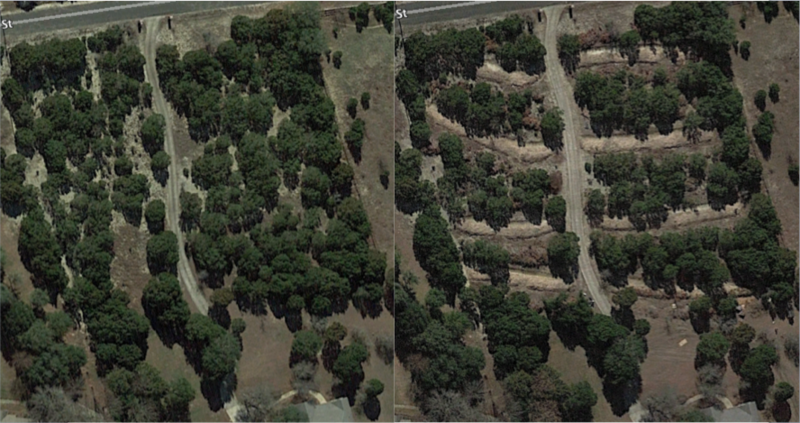 While most folks would just bulldoze all the trees down and burn the brush, we came up with a much gentler solution. 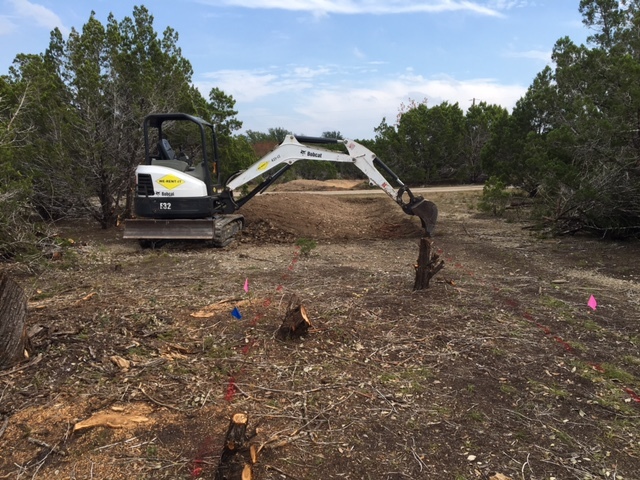 This was to clear only the juniper that we needed to get other plant species easily established and use the remaining juniper trees as nurse trees to provide shade and wind protection. We began by surveying some levels lines through the cedar trees, all measured 70 feet apart on at the driveway and marked with flags. These lines we used as our guide to clear the cedar trees on contour. All of the brush was stockpiled for later use either uphill or downhill from the line. 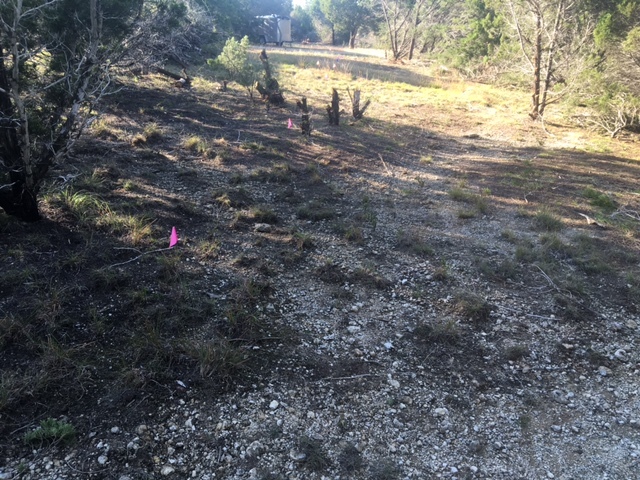 This accomplished the our clients goal of thinning the cedar trees but also left us plenty of protection from wind and the hot Texas sun. We cleared only enough to allow a mini-excavator to get in and out of the work site safely. 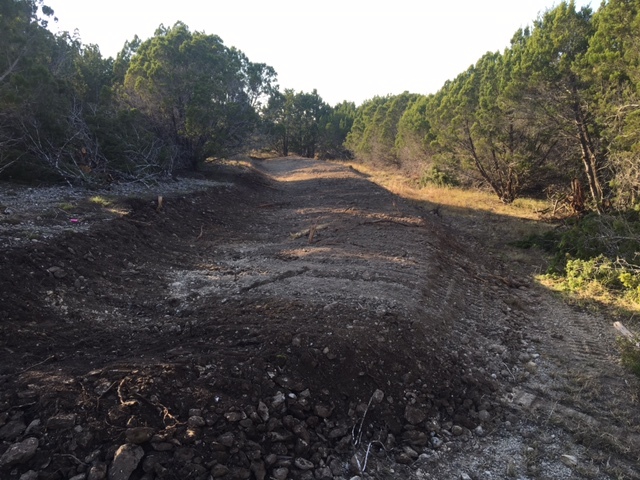 I used the mini-excavator to build a series of conservation terraces that will virtually eliminate runoff and provide a platform to plant a great diversity trees, native grasses, wildflowers, and cover crops. This photo shows the 6,000 lb machine and conservation terraces being built. The terrace basins are 90 inches wide, 9 inches deep, add up to a total length of about 950 linear feet, and have a water storage capacity of about 25,000 gallons. The high calcium, gravelly soil, soaks in water very quickly allowing the basins to fill and drain multiple times in a day. Not only are these structures adding massive amounts of water to the soil, they are also mitigating hundreds of thousands of gallons of flood waters from entering the creek. The berms were about 9 feet wide and 15 inches tall at the crest. The teeth of the excavator bucket was used to break up the soil into very small pieces to provide great tilth for plants to grow in. These berms are excellent for planting native trees and even fruit trees into, their roots are easily able to proliferate in the decompacted soil. Here a conservation terrace that has just been completed. Notice how close we were able to keep the cover from the cedars. We were fortunate to be able to call for help from the Earth Repair Corps and Kirby Fry to finish the project. We organized a Permablitz around this design where volunteers came to help install irrigation, plant seeds, plant trees, build tree cages for deer protection, and spread mulch over all of the bare soil. This is a great way to meet people in the community and get lots of hands on experience. The results, as usual, have been spectacular and will continue to get better as the soil improves due to added moisture and root activity. Here you can see the first seeds coming up, the trees planted with tree cages, just after a rain. A picture from the following summer. American basket flower in the foreground. By harvesting water, bringing in organic material to cover the ground, and planting seeds we can help even the most degraded landscapes provide function and beauty that we can be proud of. The client mentioned recently that this garden was “One of my favorite places to be!”. Maintenance for this system is not hard. The most important things are to keep adding mulch where the ground has not recovered yet, check that each tree is getting water from the irrigation system, pruning as needing, and taking down the mature vegetation during the winter so that light can reach the growing points of the plants in the spring. I was not able to be at the Earth Repair Corps Permablitz event for this site because I was visiting Oaxaca, Mexico. Curiously, we ran into some conservation terraces that were built by the locals. They had been using a system very similar to ours in the limestone mountains of Oaxaca for many generations. Their main crop was agave, from which they harvested the “aguamiel” or honey water from the base of the flower stalk. A 1000 liters of this agave nectar can be harvested from one plant over the course of 3-6 months. According to Native American history this process was discovered over 1000 years ago. The honey water is used medicinally and they also ferment this liquid into a particularly viscous beer known as pulque. 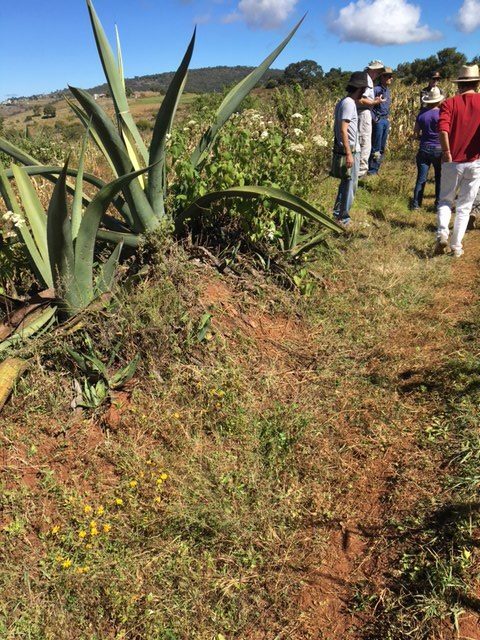 The agave plants themselves are controlled in the local villages because of their value. 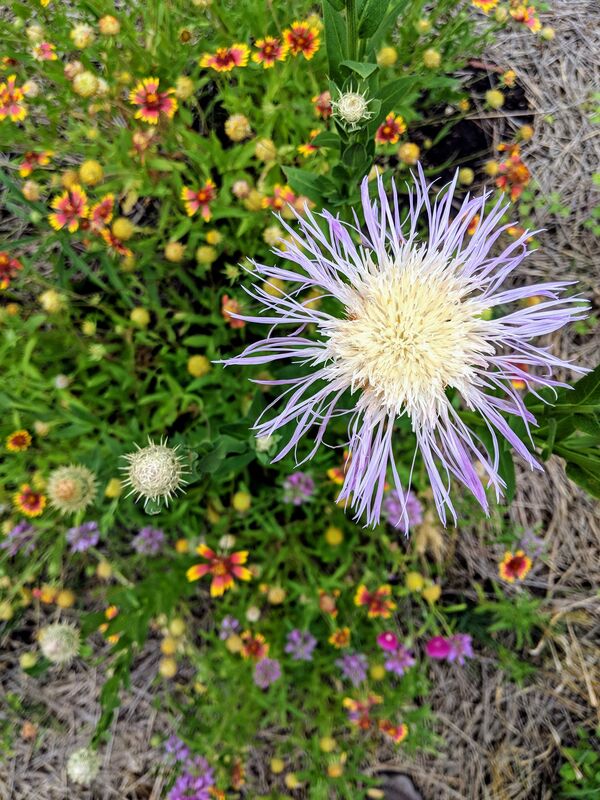 They grow these highly prized plants on conservation terraces almost identical to the ones I built on this site in Leander, Texas. They said the terraces were used to harvest water and prevent the soil from washing away during heavy rains. The climate there was almost like a limestone mountain desert covered with cactus and thorny trees. 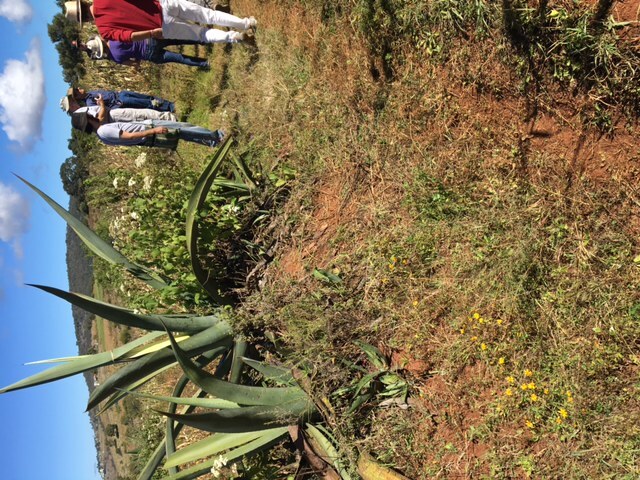 Photo of indigenous conservation terrace in Oaxaca, Mexico with agaves growing on the berm. We got to taste the aguamiel and pulque right off the farm. They were also growing corn in soil conditions that I could not believe. The success due to adapted genetics from generations of selection. Great post and pictures. Great tie in with generational experience from Mexico. Blessings.